I think the Indian Cricket team felt that they and the Pakistanis should jointly comply with the Indian Prime Minister Atal Bihari Vajpayee’s bidding. So probably Saurav Ganguly told his teammates “khel jeetnay ka kaam ham karenge, dil jeetney ka kaam unko karney do” – Let us win the games and let the Pakistanis win over Indian Hearts! “How can I charge you fare? You are our guest” said our rickshaw driver. “Although cameras and binoculars were not permitted into the stadium, the rules were waived for Indian visitors”. Well it was the British who were instrumental in pushing us apart and now its their very own game of cricket that seems to be bringing us together at a time when the cricket teams of both the countries – India and Pakistan are more than a match for the English team of today. Irony of fate. Great expectations have arisen. There has been a meeting of hearts and friendships sealed. 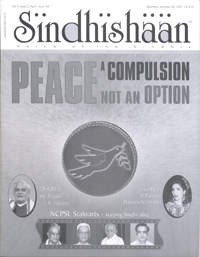 As Shri Dayal Jethwani responded to Sindhishaan’s opinion poll with “PEACE IS NO LONGER AN OPTION – IT’S A COMPULSION”. We look up to the leaders and politicians of both the countries to take further steps to promote peace, harmony, friendship, goodwill and trade between the two neighbouring countries and to strengthen the hands of our visionary Prime Minister who has never shied from taking bold and innovative steps towards peace and stability. Let’s usher in an era where ‘missiles’ mean only Shoaib’s inswingers and ‘defence’ refers to Dravid’s ‘wall’. Taking off from my last message Sindhishaan takes the next step by bringing forth 2 sections – one in the Devnagri script and the other in Arabic. And encouraging us in this endeavour has been Sindhishaan’s friend, philosopher, guide and mentor Shri Jhamatmal Wadhwani, who in his own way has been a beacon and torchbearer for the cause of Sindhiat. Lastly, Sindhishaan wishes to share with our readers, news about the spectacular achievement of our Editorial Consultant – Dr. Baldev B. Matlani who has been designated the post of Professor in the subject of Sindhi, University of Mumbai, for the first time ever. A record in the faculty of Sindhi language and literature. We rejoice in his achievements and wish him greater success.